The many, many years of formal professional development I’ve attended over many, many years in K12 education in no way equal the professional development opportunities I found for myself in the last few years across my online communities of practice and through open structure conferences that offered me choices and flexibility. Participate.com allows us to pull all of this goodness together for ourselves and for the learning communities we serve. Way back in 2016 I wrote a post about Participate.com, Curating with Communities. It was definitely time for a revisit. A recent winner of the ISTE Seal of Alignment Report, Participate.com is a professional learning networker’s dream, packed with features offering local relevance as well as the potential for global connections. Technology has made our world more interconnected than ever, which is why students must learn how to use digital tools in appropriate ways. Before we can develop students’ digital literacy, we must first equip teachers with the tools they need to create authentic learning experiences in their classrooms. Designed to connect educators in active, collaborative environments, the Participate platform offers a realm of options that include opportunities to build and join communities, develop or be part of existing professional development courses (many with the option of microcredentials), the ability to collaboratively curate resources in collections, opportunities to participate in Twitter chats and much more. Participate’s Director of Education Strategy, Dr. Jennifer Williams, shares that the goal is to be the glue, pulling together the array of possible professional development options–edCamps, Twitter chats, workshops, conferences, PLN sharing, and more–into one uniform experience. The tabs on the redesigned dashboard represent the realm of learning opportunities. Let’s take a deeper dive into a few of those opportunities. Librarians and classroom teacher partners will appreciate the updated Collections feature. Searchable or browsable by tags, grade level and subject area, Collections allow users to collaboratively curate, organize and share resources–apps, lesson plans, handouts, websites, documents, presentations, videos, etc. Collections support flipped and personal learning, the creation of learning playlists, safari challenges, the sharing of professional development materials, and planning with our PLNs , our grade-level and departmental teams. Updated interface for more intuitive curation. Expanded permissions capabilities. Now you can control who is a contributor, commenter or viewer. 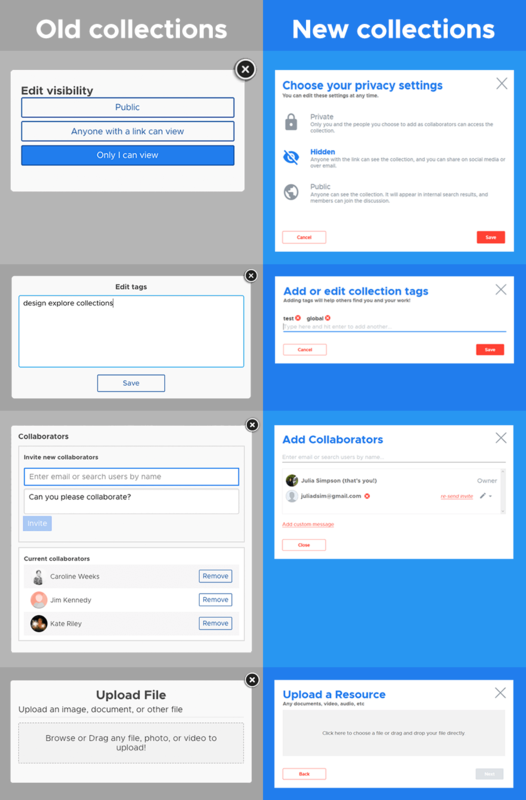 Easily add more than one collaborator at a time to a collection. Subscribe to any public collection so you can see when comments or new resources are added. Quickly find what you need though new search, filter and sort functionality. Communities are ecosystems for specific learning communities, offering a variety of entry points for communication and collaboration. From your Participate.com Dashboard, your Communities appear front and center. You can search or browse for Communities of Practice that align with your interests and choose to “Join a New Community.” CoPs are organized by category, topic or interest. Community home pages share a description of the Community’s goals and any announcements. The Learn tab leads members to both formal and informal learning opportunities. The Resource tab leads to community-specific resource collections. Connect leads to community members’ profiles and the opportunity to send them messages. The Discussions feature allows the members of a Community to create, monitor and contribute to ongoing, searchable threaded conversations around a question or topic. It’s a great tool for planning, brainstorming and crowdsourcing solutions, allowing users to share media and attachments and upvote favorite responses. Participate’s Chats categorize educational chats into buckets allowing you to find just the right chat by subject or type. You can search the huge chat list, check out what’s trending or chats recommended to match your interest. Find a rich calendar of live chat options on the top of the page. Librarians will not only want to discover the right Twitter chats for their own professional interests, we will also want to locate and recommend chats to serve the needs of our partner educators and administrators. One of my favorite Participate Chats features is the ease of archiving transcripts immediately and automatically organized the familiar into Questions and Answers semantics. Participate eliminates the extraneous noise of confusion of the live chat, amplifying the content of interest. You can revisit past chats at your own pace and a handy menu item allows you to discover and easily follow participants you find inspiring. This is a great tool for veteran Twitter users as well as newbies who have not yet recognized or have summarily dismissed the power of chat for educational discourse. I asked Brad Spirrison to give you, and one of my classes, a little tour around the updated Participate,com platform. When the school year begins, suggest Participate.com you’ll want to connect your learning community with this serious toolbelt for professional growth.